So you lost your car key? 10 years ago when I knew nothing about car keys I thought these items cost, well $1, $2 perhaps? And I was partially right. First of all, the implementation of security systems like a transponder, chip, RFID, was not widely spread through all car makes and models. Secondly, I already had a key, so getting a spare key was only a matter of going to any locksmith with the capabilities of copying keys. It did, in fact, cost me about a buck to get a spare key back then. That was no longer the case 4 years later when I lost my Ford F-250 key. I replaced my car key for an outstanding $253. This is when my research on the matter began. It is better to prevent than cure! Replacing car key from scratch is usually way higher than making a spare car key. As has been noted earlier, when you actually have one working key it can cost you less. When you need a copy of car key, a locksmith can get the cuts out of the existing key. Get a second key now; if you lose the only one you have, a new car key costs in average about double. This is because it is more difficult for a locksmith to get the bitting or cutting specs for your vehicle. A good place to get spare car keys is by calling your local auto locksmith. Specialized locksmiths have a greater selection of transponder, VATS, PATS, and laser car keys. They use the VIN# or key code to make the car keys. For this reason, we would like to give you the highlights of a few more reasons why you may need a spare car key. What is a key code? A key code is a number or string of characters that tells special machinery how to cut a key. Each car key has its own unique key code. Having the key code will save you money when using the services of a locksmith because it facilitates their job. Save your car key code now. As all car makers have limits of how far back in years they have key codes saved in their systems, you better save it now. One day eventually, it will be impossible for you to find it once your car reaches 10 years old. Having a key code will typically save you good amount of money. Note :Not all keys are made the same! The world of spare car keys is full of variety. Getting spare car key made for 2 cars of the same year and of the same make does not necessarily mean they cost the same. Ask a locksmith or a dealership on the phone if the key for your auto needs to be programmed. If your vehicle uses VATS, transponder, PATS, chip, and how much it costs. Buying online or with a local locksmith is usually the way to go, you get the same key and is usually cheaper. To Key or not to Key: Locksmith or Dealer? Do you know how much more expensive it is to have an automobile dealer replace a car key versus a Locksmith? Some dealerships charge $200 or more to replace a transponder key (keys from newer cars). This is a common issue across the United States. The expense is not from cutting the car key, which only costs a dollar or two in parts and labor. Much of the cost comes from the cost of the key code and the electronic chip in your vehicle’s key itself. If you have a perfectly cut key without the correct programming for the chip, you can put it in the ignition and turn the car key and nothing will happen. Your car won’t start. The dealer will charge you a marked up price for the transponder chip as well as a higher base pay to cover the salary of the worker. This cost gets passed on to you, the consumer. Shouldn’t you get a discount for bringing your car to them? A better option is to buy your replacement car keys from a locksmith. A locksmith will use the same equipment as a dealership but will charge up to half the price to replace your key. However, a locksmith can help you much better than a car dealer. For instance, when you lock your keys in the trunk. The main reason is you don’t need to tow your car to a local dealership. Many Locksmiths will even come to you. The most important part of getting your car key replaced is making sure the chip inside the key is programmed properly. 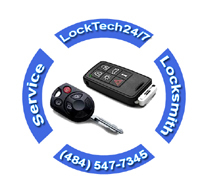 LockTech24/7 locksmiths, for instance, can duplicate car keys on-site. Always test your new key before leaving the locksmith or as soon as you get home with your new car key. Contact the locksmith immediately if you have any problems unlocking the door or starting the car. If the car does not start it may mean there was a problem with the programming or even the cutting of the key. And eventually, you will need to get the replacement car key replaced again.